I think we might all agree, that a multi-billionaire who has branded his company using the word “Virgin” views life through the lens of newness… AND has been very successful translating innovation into an effective economic engine. While Branson’s personal vision is really important to this, the real question is: How do vision, culture and leadership work together? How do you lead a culture of renewal among thousands of people … and remain consistent in delivery? Richard Branson reveals in a new interview with Dan Schawbel in Forbes, his top 3 leadership principles. I reveal my thoughts on how these have been part of our culture work for 15 years. Read and enjoy! 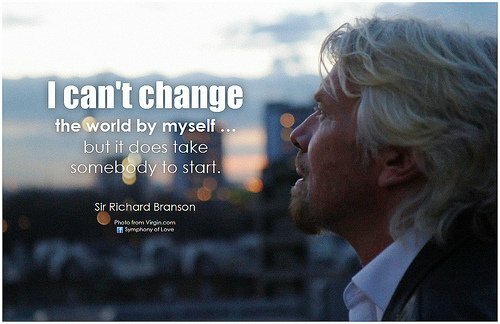 Branson is an international entrepreneur, adventurer, icon, and the founder of the Virgin Group. The Virgin Group is one of the world’s most recognized and respected brands, with over 400 companies. His previous best-selling books include Like a Virgin: Secrets They Won’t Teach You at Business School, Losing My Virginity, Screw It, Let’s Do It,Business Stripped Bare, Reach for the Skies and Screw Business As Usual. According to the Forbes 2012 list of billionaires, Branson is the sixth richest citizen of the United Kingdom, with an estimated net worth of US$4.6 billion. Today, Branson’s Pioneering Commercial Spaceflight Virgin Galactic announced a global partnership with Grey Goose Vodka. Dan Schawbel: How would you describe your leadership style? How do you believe this style makes your company culture unique? Lisa Jackson, Culture Pro: What Branson says is not literally about rules, more about the freedom to create. When you run 400 companies with thousands of people – eg, flying aircraft to the moon – you need a few rules you don’t break! Corporations need to distinguish between smart rules (values, systems, and practices that enable collaboration, trust, consistency, customer focus) versus rules that create bureaucracy: Blind adherence to activity without connection to purpose. Unchallenged thinking is a certain route to extinction in today’s dynamic times. Schawbel: What is your process for selecting leaders at Virgin? What qualities do you look for in new leaders and what qualities are your biggest turnoffs? Branson: I’m quite involved in hiring for leadership and I look to hire my weaknesses. Personality before CV. A person who has multiple degrees in your field isn’t always better than someone with broad experience and a wonderful personality. I like to take chances on people, and whenever possible, promote from within – it sends a great message to everyone in the company when someone demonstrates a passion for the job and leadership skills at every step along the way and is rewarded with a leadership role. Jackson: Brilliant. Culture 101. Every cultural evolution I have been part of, has had to make hard decisions and act with courage on this front. It’s not a short, quick hit game – hiring for cultural fit over skill. But if you are serious about culture you have to do it this way. See our Culture-Hiring Fit tool for more on this. Schawbel: How did you originally come up with Virgin’s values, vision and mission and then find the right people who believed in you and the company? Branson: The Virgin values have and will always be the same: to change the game and challenge the status quo by providing a product or service of great use. My first business venture was Student magazine. Along the way, we saw gaps in the market where Virgin could play a role and can be an incredible force for good, and that’s become our motto. If you love what you do and if you believe in what you do, others will share your enthusiasm. Passionate people find their way to the Virgin Group, and when they do, we snap them up and try to keep them within the family. Jackson: Leaders don’t spend enough time talking about their company values, in my experience. It’s never about what the Values are on paper. It’s about how much leaders talk about them, DO the behaviors that lines up with them. This is what creates Truth in Values. The cultures that grow from this simple principle, light up the world. They inspire through authenticity, not lip service. Creating a new generation of great company cultures built to adapt, evolve, and continuously serve customers with relevance?